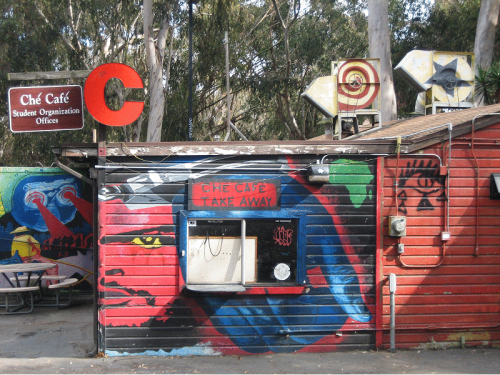 The Ché Café, a 34-year-old student-run cooperative at the University of California, San Diego (UCSD), has been under attack by the administration for the past two months and was served with a 30-day notice of eviction on June 13, 2014. While the administration had stressed that the reason for the Ché Cafée’s need to vacate their building was due to the fire hazard posed by the lack of a fire sprinkler system, yet the notice of eviction states that is is due to the Graduate Students Association (GSA) resolution passed on June 2, 2014 to decertify the Ché Café. In this resolution the GSA requested that the University terminate the Ché Café’s lease. It is the Ché’s position that both the GSA “decertification” action and the termination notice are invalid and politically motivated. Story continued below University Centers – The Ché Café’s landlord – has neglected the Ché facility for decades, refusing to provide funding for maintenance, which over the years has built up. Rather than setting aside reserves, as they were recommended in a 2009 audit, University Centers has chosen to expand the Price Center which put it in deficit. They have made no serious attempt to develop a plan that would secure maintenance for all three student centers (the Ché facility, Price Center, and the Original Student Center). More information regarding University Center’s budget can be found here. The University’s decision to terminate the Ché’s lease is another example of the unfair application of fire, health, and safety codes. The same approach has been used during previous attempts on the part of the University to evict the Ché Café. The issues that have been brought to the Ché’s attention during the previous two months should have been communicated to the Collective at least since the 2012 Fire Marshal Report in which a fire sprinkler system was recommended. That these issues were not brought to the Collective’s attention, and a potential solution as to how to fund the recommended improvements was not discussed years ago demonstrates the willingness of the administration to evict Ché Café. The students and community members involved with the collective are still in the space and plan to be remain there past the July 13 deadline to vacate. More information regarding the struggle to keep the Ché Café open can be found at: www.facebook.com/savetheche. Administration officials at the University of California San Diego are taking steps to close The Ché Café Collective, a 34 year old, student run cooperative nonprofit. UCSD served the Café with a 30 day notice of termination on June 13, 2014, due to a lack of an extension given a Graduate Students Association resolution passed on June 2, 2014 to decertify the Ché Café. This was given following the Café’s request for dispute resolution with UCSD on May 22nd and after the Café registered a legal protest to the validity of a motion by the GSA to “decertify” the Café. The Ché Café believes that both the GSA “decertification action” and the termination notice are invalid and motivated by internal politics. UCSD also continues to refuse to answer the Café’s questions as to why it is necessary that the facility be closed and why UCSD will not work with the Café to resolve any issues it has and allow the Café to repair or remedy any recommended fire, health, or safety issues. The Café believes that the fire, health, and safety issues are a pretext for shutting the building down. The Café has been on holdover status since 2008. Throughout the ensuing years, UCSD has never been able to reach agreement with the Café about an extension. UCSD rebuffed the Café’s good faith negotiations to renew, renegotiate or extend the lease. UCSD invited the Café and its lawyer, Andrea Carter, to a meeting ostensibly for discussions about the future of the Café and try to resolve various issues. Instead, UCSD greeted them with a Notice of Termination. The meeting followed the Café’s requests to mediate and resolve issues through the dispute resolution procedures provided in the lease. At the meeting, UCSD refused to discuss anything but where the Café would be relocated. The Café would like a stay of termination pending the end of a dispute resolution under the agreement. The same approach of using health and safety or low student support has been used during previous attempts in 1993 on the part of the UCSD to evict the Café from the space. The Craft Center suffered the same fate in 2012 when UCSD closed it for pretextual fire sprinkler reasons. Even when the Craft Center’s supporters raised over 1 million dollars the University shut it down and refused any fundraising monies that could be spent to keep it open. Similarly here, while Vice Chancellor Matthews said in the June 13th meeting that the Café could fundraise, UCSD refuses to give written assurances of that. Matthews stated the University has over $350 million in backlogged deferred maintenance. This may be UCSD’s true motivation for the shutdown (to see the building demolished rather than retrofitted) or it may have something more lucrative planned for the space. UCSD has deferred maintenance of the Che facility for decades. UCSD refuses to state what they may be planning to do with the facility, a historic building once part of the Matthews Marine Base and containing famous and historic murals. In fact, prior to the June 13th meeting, UCSD insisted that the fire sprinkler repairs were its responsibility and cited UCAB and University Centers (UCEN) budget deficits as a reason why the UCSD could not afford the upgrades and why the facility must close. Then, at the June 13th meeting, UCSD’s attorney stated it was, in fact, the Café’s obligation. The Café, however, never received any notice from UCSD prior to the budget meetings that UCSD considered the fire sprinkler system an issue. More information regarding the struggle to keep the Che Cafe open can be found at: www.facebook.com/savetheche.